In this post, I am going to share some useful tips for traveling in Japan, mostly what I learned from the locals during my 2+ years stay. 1. Explore the different train/bus passes. Purchase one-way/round trip tickets from Kinken shops (discount ticket stores). There are numerous passes in Japan, especially for trains. 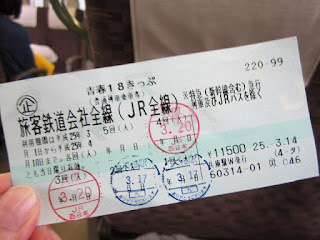 From all-Japan pass to regional/city passes, from 1 day to 7 days (or more) passes, from JR to private rails, it’s crazy how many options there are! It is possible to save up to half the cost by making use of such passes. For one-way/round trip tickets, a cheaper alternative to purchasing directly at train/bus stations is Kinken（金券）shops/machines near stations. Also, if you are considering Seishun 18 pass（青春１８切符）and cannot finish all 5 trips, it is possible to buy/sell used tickets with 1-4 trips remaining at a Kinken shop! 2. Consider all options for airport transfer, including shared taxi. There are many airport transfer options, most commonly being train and limousine bus. If you are flying in/out from Kansai Airport, have big/heavy luggage and do not want to make transfers, consider taking shared taxi such as MK’s Skygate shuttle. It is a reliable and hassle-free door-to-door service, making reservations in advance is necessary. 3. Make use of lockers, hotels and delivery service for luggage. 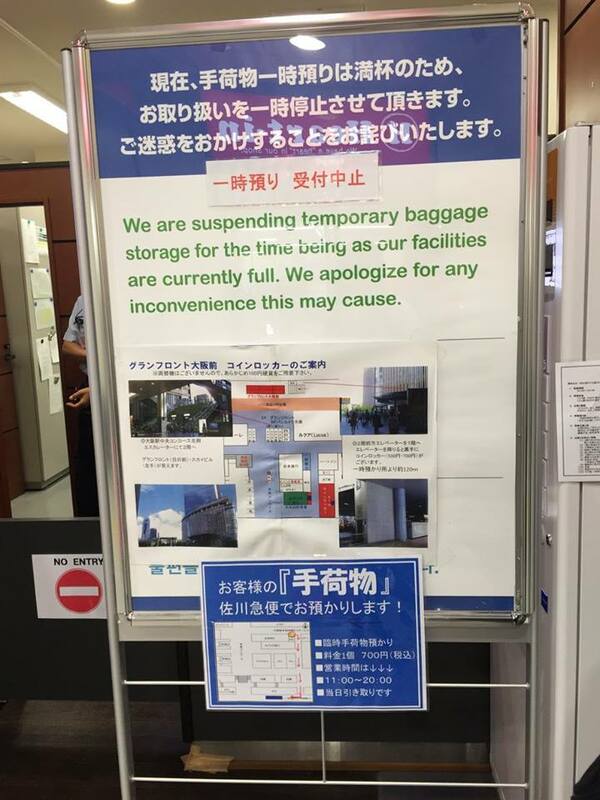 Lockers are available at most train stations, though very often there are just not enough lockers/big size lockers during peak periods like Golden Week. 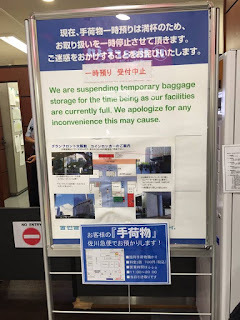 Check with the train station staff, some stations may have Ichiji Azukari（一時預り）service, where they will look after your bag for a few hours. Though during peak periods, even such service may be unavailable by late morning. If possible, the best option is still to leave your luggage with the hotel you are staying. Another way is to use delivery service such as Yamato Transport. They can collect your luggage from one hotel and deliver it to your next hotel. Also, if you can already fill one bag with shopping goods + dirty clothes and do not want to lug it for the rest of your trip, you can actually send it to the airport and collect it right before your departure! This is also advisable if you are flying in/out during peak hours, when commuting can be quite stressful. Note that it is necessary to register at least 2 days in advance for some airports. Delivery usually costs less than 2000 yen per bag. 4. Consider low-cost airlines such as Peach and Solaseed Air when traveling long distances domestically. If traveling to Kyushu/Okinawa from Kanto, or Tohoku/Hokkaido from Kyushu/Kansai, consider LCC, which are usually cheaper than taking the bullet train unless during peak periods. 5. Get a rental Wi-Fi or SIM card. Free Wi-Fi is not easily available everywhere in Japan, though the situation is improving. Get a rental Wi-Fi if you have a few gadgets/companions with you, and a SIM card if traveling alone with a smartphone. 6. Bring along a plastic bag when traveling. There are hardly any rubbish bins on the streets of Japan. Locals bring their rubbish back and recycle them. For travelers, I suggest putting rubbish in a plastic bag and bringing back to the hotel, or dispose them accordingly (burnable, plastic etc) in bins on railway platforms and convenience stores. Just don’t litter! 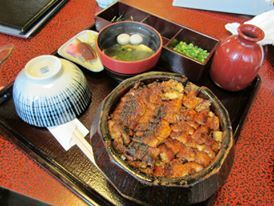 Different prefectures are famous for different food. Try Takoyaki and Kushikatsu in Osaka, Okonomiyaki in Hiroshima, Gyutan and Zunda in Sendai, Castella and Champon in Nagasaki, Hitsumabushi and Tebasaki in Nagoya, and the list goes on. 8. Money changer and travel adapter. Money changers are difficult to find in Japan, though the situation is improving. Make sure you have enough Japanese yen before starting your trip. And bring along a suitable adapter. Before buying any electrical appliances, check if it is usable outside of Japan.